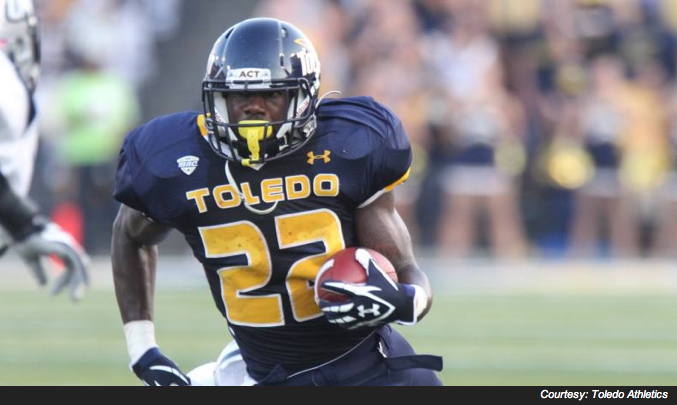 Congratulations to David Fluellen’s career night in football for Toledo Athletics. Attached below is the article write up from the Toledo Athletics website on this Proformance athlete. Kalamazoo, MI – Junior running back David Fluellen rushed for a career-high 213 yards and three touchdowns to lead Toledo to a 37-17 victory over Western Michigan at Waldo Stadium Saturday night. Fluellen shattered his previous best of 109 yards in the first half alone, gaining 123 yards and scoring twice on nine carries as Toledo held a 20-7 advantage at the break. Fluellen’s third TD of the night made the score 34-9, effectively putting the game out of reach midway through the third quarter. Junior quarterback Terrance Owens balanced the Rocket attack by connecting on 22-of-33 passes for 243 yards. The Rockets outgained the Broncos, 521-405, as Toledo’s defense kept Western Michigan off the board until late in the second quarter. The Rockets’ defense also picked off WMU quarterback Tyler Van Tubbergen three times, recovered one fumble and had a defensive score, a 63-yard interception return by sophomore cornerback Jordan Haden in the third quarter. Toledo wasted no time getting on the scoreboard, scoring on its first three possessions while WMU failed to make a first down. The Rockets pounded out a eight-play, 67-yard drive on its first possession as Fluellen bulled in from six yards out to give Toledo a 7-0 lead. The Rockets followed that up with an 11-play drive on its next series that led to a 20-yard field goal by sophomore Jeremiah Detmer. Toledo then bumped the score to 17-0 on a career-best 53-yard bolt by Fluellen with 4:32 to play in the first quarter. Another field goal by Detmer, this time from 28 yards, made it 20-0 Rockets with 7:59 left in the half. The Broncos finally got on the scoreboard with 3:00 left in the half when QB Tyler Van Tubbergen survived a blitz and connected with Jaime Wilson for a 22-yard scoring strike to cut the lead to 20-7. WMU cut Toledo’s lead to 20-9 early in the third quarter when Dwight Macon fielded a booming punt on the one-yard line and was tackled in the end zone. But the Rockets put the game out of reach with Haden’s interception return and Fluellen’s third TD run of the game, a 22-yard scamper with 6:47 to play in the quarter to make the score 34-9. The Broncos cut the lead to 34-17 on a 48-yard TD run by Brian Fields with 39 seconds left in the third quarter. Toledo extended the lead to 37-17 on Detmer’s third field of the game, a 23-yarder with 9:44 to play. The Rockets will return to conference action next week when they host Central Michigan in a MAC West battle. This entry was posted on Wednesday, October 3rd, 2012 at 8:08 pm	and is filed under Athletes In Action, Events and News. You can follow any responses to this entry through the RSS 2.0 feed. You can leave a response, or trackback from your own site.